A team of scientists from Carnegie and George Mason University, using facilities at HPCAT, have provided new insights on the behavior of silica under pressure at room temperature. These new findings are published in Nature Communications. Silica (SiO2) is one of the most abundant minerals and a major component of the Earth’s crust and mantle. Its various high-pressure forms make it an important study subject in research on the transition between different chemical phases under extreme conditions, such as those that exist in the deep Earth. The first discovered high-pressure P-T phase of silica is called coesite (Fig. 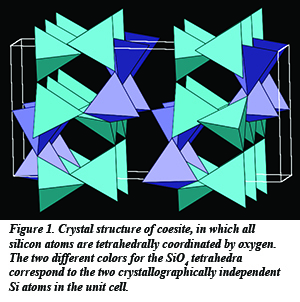 1), which, like quartz, consists of building blocks of silicon atoms surrounded by four oxygen atoms in tetrahedral coordination. Under greater pressures and temperatures, it transforms into an even denser form called stishovite, with silicon atoms surrounded by six oxygen atoms in octahedral coordination. Previous work demonstrated that a crystalline-crystalline transformation occurs in coesite at 25 GPa along with amorphization at room temperature compression, based on evidence from Raman spectroscopy and powder x-ray diffraction [see R. J. Hemley et al., Nature 334, 52 (1988)]. 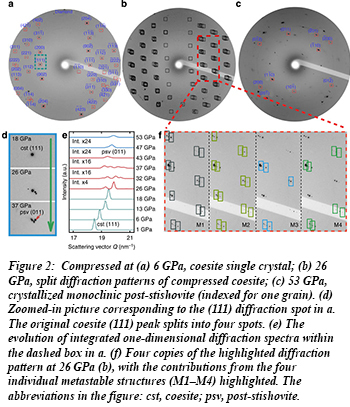 The new work shows that at the same pressure, a single crystal of coesite transforms into four new, co-existing crystalline domains before finally recombining into a single phase that is denser than stishovite, sometimes called post-stishovite, at 52 GPa (Fig. 2). Earlier experimental studies also showed that such transitions in polycrystalline silica produce heterogeneous samples containing both crystalline and amorphous material [K. J. Kingma et al., Science 259, 666 (1993)]. The present technique was not sensitive to the amorphous component. Advanced theoretical calculations also provide a detailed description of the transition paths from coesite to the four crystalline domains and then subsequently to post-stishovite [Q. Y. Hu et al., Nature Comm 6, 6630 (2015)].